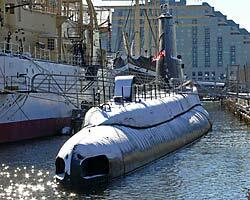 You can visit the USS Becuna on the Delaware River in Philadelphia, PA. This submarine is an American Balao class fleet sub which was converted to GUPPY configuration in 1950. The USS Becuna is a genuine WWII veteran and has been credited with the sinking of 3.5 Japanese merchant vessels in the last months of the war. This submarine is interesting in that it survived the war to be converted to the GUPPY 1A (Greater Underwater Propulsion Program) configuration. Drag was reduced by removing the deck guns, streamlining the sail, adding a snorkel system and smaller higher performance batteries. 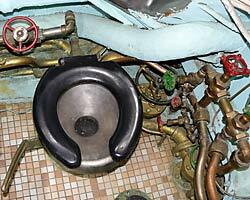 Some of these innovations were borrowed from late war German Navy U-Boats. The Becuna is nicely restored and most of the compartments are intact with period equipment in place. The interior is tight and gives the visitor a feel for what it must have been to live aboard and how much space the sailors had to live and work in. In the forward torpedo room the torpedoes have been removed making more room to see the various torpedo loading equipment and other features of that compartment. Looking up to the ceiling you'll see the Escape Trunk, a compartment that could be flooded and drained in order to allow crewmen a chance to escape should the sub sink to the bottom. It is very well lit and you can get a good look inside. 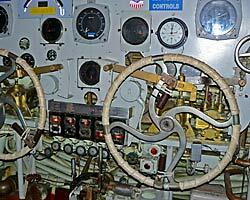 The aft torpedo room has both intact and cutaway torpedoes so you can see their inner workings. 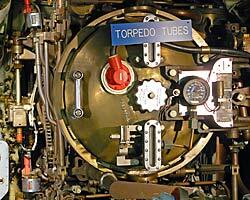 One torpedo tube is open and lit so you can see what it looks like inside. The flat cart with rollers inside would be used by a crewman who would clean and grease the inside of the tube. The officer's quarters and Captain's Cabin have a few period items and have been cleaned up well. 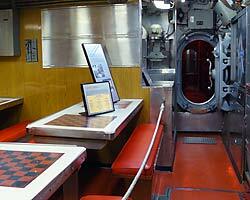 The Wardroom is in good shape and walled off with plexiglas as are several other compartments. 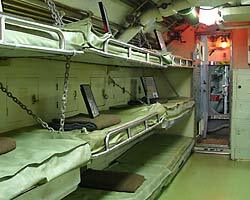 It is simple but better and roomier than the crew's mess. The control room has been well restored. Handles on critical valves have been removed or locked to prevent the curious from getting into trouble. 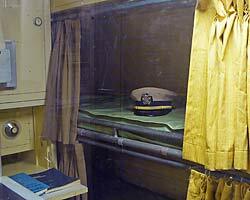 The conning tower is blocked off with plexiglas. 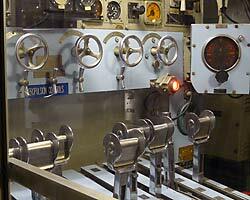 The Becuna's engine rooms are well cleaned up and painted and seem to have most of their controls and instruments in place. 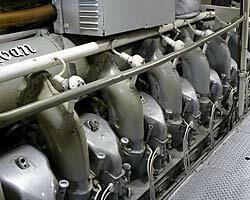 One valve cover is off one of the GMC V-16 diesel engines giving you a good look at the valve train rocker assembly. The heads are tight and filled with a bewildering array of pipes and valves. Flushing was nothing like it is at home! Topside the hull needed some attention when I was there in 2007, but since then the USS Becuna has been repainted in a lighter and better looking Navy Gray. The USS Becuna is not in handicap accessible. 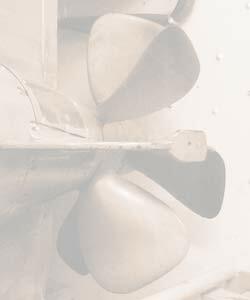 Visitors should be able to manage climbing down a flight of stairs to enter the sub, then be able to step over high thresholds at each watertight door between compartments. Food is available in the cafe of the Philadelphia Seaport museum. Tours of the sub are self-guided. 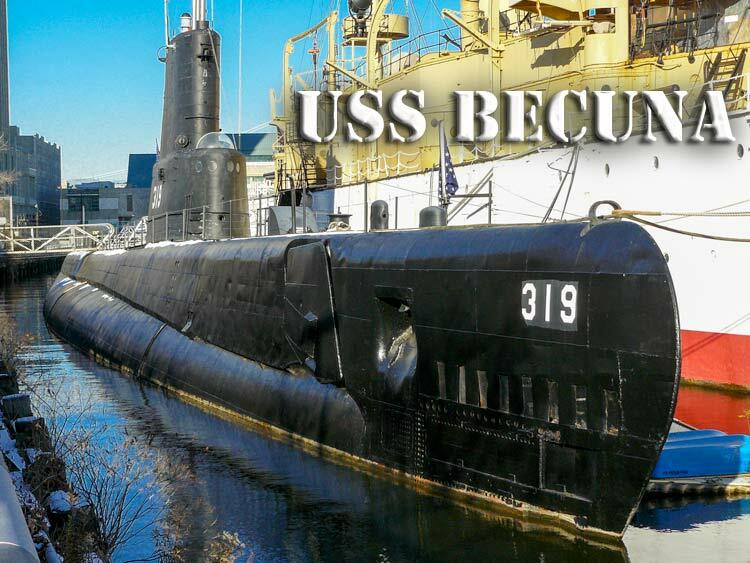 Visit the USS Becuna Museum Website for information on hours and directions.